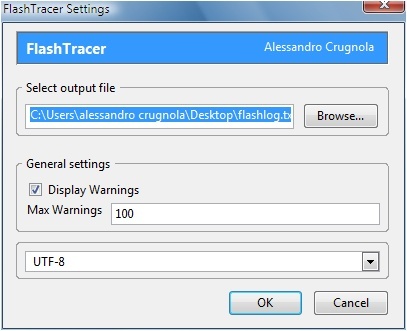 With the new FlashTracer FireFox plugin compliments of Alessandro Crugnola (Sephiroth), you can see all of your (and everyone else's) trace statements from within FireFox. The plugin creates a sidebar that displays all of the output in real-time. This really aids in debugging and will undoubtedly help anyone who is working with remoting or any other server-side integration where running remotely is necessary. You'll need to download and install the debug version of the Flash Player, which is free from Adobe. 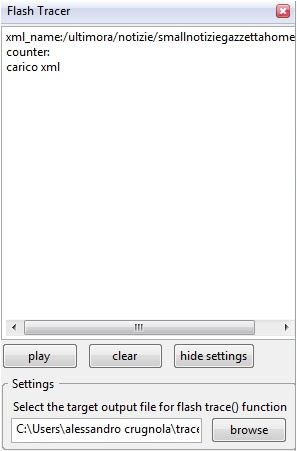 While this isn't a new concept (you can set it up yourself manually following these instructions), this new FireFox plugin really takes all the work out of making it happen. And, it adds a ton of additional features such as searching the output with RegEx, viewing runtime warnings (for Flash 9), and limiting the size of the log file it is writing to. I must say that last one is the biggest gain for me. I had setup the debug Flash Player and modified the config files to show traces to a text file, but I would have to clear the file just about every day since the filesize would eventually become to big. Looking forward to putting this one to good use. Thanks Alessandro!